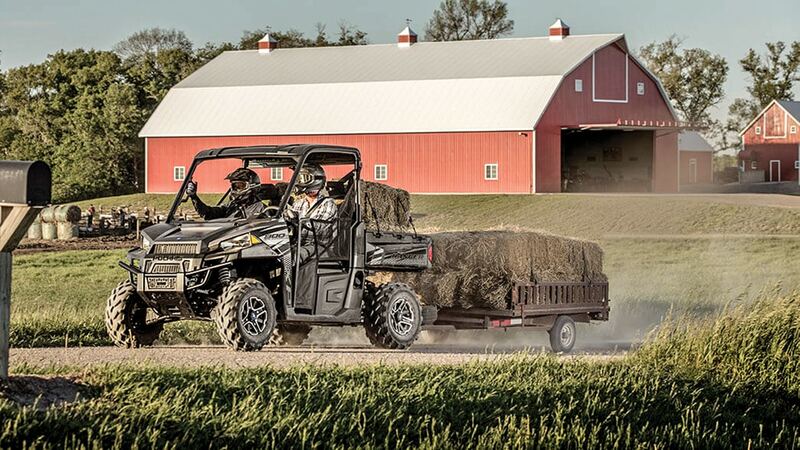 I just got a sweet deal on a 2018 demo Polaris Ranger XP 900 EPS in Matte Titanium Metallic, and I intend to install some accessories due to the low original purchase price. So, I was wondering, in your opinion, what order and type of accessories should I install so I don’t make an expensive mistake. I am considering a cab for all-season use and some extra lights for night work. Thanks for any advice you can provide me. en-us/shop/accessories/doors/. As to lights for night work, a roof-mounted light bar is a must, as well as a smaller light bar for rear light. A bed light helps with cargo loading and unloading, and finally an automotive dome light is a must if you need to read anything inside the cab at night. Add a 4500-pound multi-mount winch (because 3500 pounds is barely enough when your Zooter is buried hub-deep in gumbo mud). The Warn Polaris multi-mount winch is #2880096. Go to Everything Polaris Ranger (www.everythingpolarisranger.com/polaris-ranger-full-size/accessories/hitches.html?epr_fullsize=966) and requisition a front receiver hitch and winch receiver mount. Slap on the 4500-pound winch and you now have winching capabilities both front and rear (you will thank me for that capability later, Boot). All this info is worth at least a 15K night march—2400–0500 hours. You do not want to be considered a “drop,” Boot! Dismissed! I have an unusual request and am sure you are the only one who can answer it. I wish to change the backlight color on my 2011 RZR 1000 from red to blue. Do you know how? The unit doesn’t appear to have push-in replaceable light bulbs. .com) for a color change for about $100. Dismissed! I have a 2001 Suzuki KingQuad 300. At any throttle position above idle, it skips badly and backfires. I was told that this problem is usually the vacuum fuel pump. So, I went ahead and replaced the vacuum pump with an electric pump. However, that didn’t cure the problem. Next I was told it might be the reverse limiter. So, I disconnected the reverse switch. Again, it had no effect. Sarge, can you point me in the right direction? Private Hodgepodge, I would be most happy to point you in the right direction! Double time to Area 17 and you will pick up every unbroken paintball on the range! When you are done, then we will have a discussion about listening to everybody except someone who actually knows about your Zooter, Boot! A skip is generally not a fuel problem. Electrical/ignition defects are usually the cause. And before we get started Boot, the 300 Zooter does not have the reverse limiter! Change the spark plug and test the ignition coil. Those are the basics. Also, the 300 Zooters have from time to time blown out their voltage regulators. And with unregulated voltage as high as 17 volts, it can raise havoc with the black box or, in some cases, even damage the box, requiring replacement. A VOM meter can tell instantly what your operating voltage is. A factory service manual is very helpful here. You do have one, don’t you, Boot? Didn’t think so! Because a “free” copy is impossible to find, go to Chaparral and requisition a copy. Dismissed!